Candidly, I approached this debut from journalist Stuart Turton with a little trepidation. In recent years I've been inundated with breathlessly hyped 'it's the crime novel of the year!' tales from various publishers. While many of those books were good reads, it was hard for them to match the hype (and often left me scratching my head as other truly brilliant crime novels flew under the radar). Turton's debut is exquisitely written, intricately plotted, and manages to not only match but outdo all the pre-publication hype. It delivers on the high-concept premise, while also delivering much more. We first meet our narrator 'Aiden' in a confused and scared state, having woken in the woods not knowing who or where he is and then thinking he may have seen someone killed. With some aid he manages to stumble his way to a creaky manor, and learns he's actually Dr Sebastian Bell, a man who gets decidedly mixed reactions from various other guests who have come to Blackheath for a party welcoming Lord & Lady Hardcastle's daughter Evelyn back from her time in Paris. It's an odd grouping, and even odder timing - the anniversary of the death of Evelyn's brother years before. But that's just the beginning of the oddness. 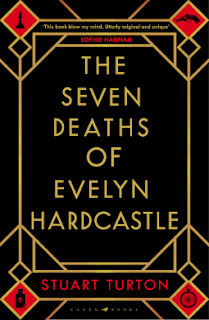 THE SEVEN DEATHS OF EVELYN HARDCASTLE is a finger-clenching, mind-bending, smile-inducing read on many levels. I particularly enjoyed the quality of Turton's writing - it's not a book that relies on it's high-concept hook alone to carry the reader through. There are tasty little 'easter eggs' in the writing on almost every page, whether a turn of phrase or a concise description that is slightly askew or new. There's an understated elegance to the wordsmithery, like a concert musician who makes something very technical, creative, and artistic seem simpler and less difficult than it is. It's a book to savour as much as devour. As you'd expect for a classic country house murder mystery, there's an eclectic cast of characters. With Turton's conceit, we not only get to view many of them from the sleuth's viewpoint, but from many others too (including, somewhat, their own). It's a Rashomon-esque aspect of THE SEVEN DEATHS OF EVELYN HARDCASTLE, which is also very well done. The same events seen through different viewpoints, as well as Aiden's various viewpoints skewed by each of his hosts. 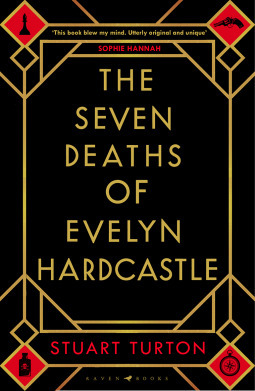 There is so much to admire and enjoy about THE SEVEN DEATHS OF EVELYN TURTON. Frankly, I was blown away by how good it is. While the high-concept hook might get eyeballs, it's a book which is far deeper and richer than merely a clever idea well-executed. It's the kind of book I imagine I'll still be thinking about as the year unfolds. Maybe, even, a 'crime novel of the year'.